When your car breaks down, you don’t want to be stuck without a vehicle for too long. What you need is a friendly and affordable local mechanic that will get the job done right. For any kind of auto repair in Hockinson, look no further than Art Morse Auto Repair. Our combination of service, value, and efficiency won’t be beat by anyone in the area! Some auto shops rush through the job and do a shoddy repair. A bad repair is not only at risk of not fixing the problem, but can cause new issues as well. We’re different. With over 30 years of experience and an ASE certification, it’s very rare that we make an error. But in the unusual event that this does happen, we don’t want you to worry. That’s why we include a 2 year/25,000 mile warranty for parts and labor on any repair we make. What kind of car repairs do we do? We’re ready for any problem your car might have. While we can do basic services like oil changes and tune-ups, we’re prepared for more complicated repairs as well. Is your transmission shot? We can help the gears shift smoothly again with our transmission repairs. Having trouble with emissions? We do exhaust system work including special emissions checks. Weather problems? We can replace your heater core or your A/C system so you can feel great. Need a second opinion? 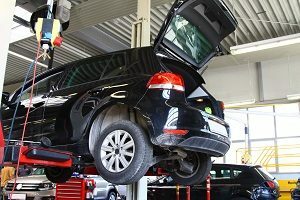 We can do an inspection to make sure your new car works like it should! One of the most annoying parts of your vehicle breaking down is that you have no way to get around. While you could call up friends and family, you don’t have to with our free courtesy shuttle. We also do repair jobs based on work done, not the time spent. We believe that by doing this, you can be sure that we strive to do quality work and spend our time working, so you know your money is put to good use. We’re also Triple A approved! So give us a call or contact us today for local auto repair you can trust!